Air source heat pumps are an electrical green heating and cooling technology used to regulate air temperature in a building. With air source heat pumps, you can keep your home warm in the winter and cool in the summer. Using this technology will help save you money because the operating costs are lower than traditional home climate systems that run on gas, oil, and more. Can be used to both heat and cool your home, depending on the season and temperature. Work even in cold climates and are an efficient heating solution for homes in New England. Can either be ducted or ductless, depending on your building, its needs and your preferences. Interested in getting air source heat pumps for your home? We can help you obtain quotes from local, reputable air source heat pumps installers. Click the button below to learn more. Air source heat pump systems installed in Massachusetts qualify for the Alternative Energy Certificate (AEC) program. With this program, non-emitting renewable technologies generate certificates based on their energy production for homeowners to sell to utilities. The revenue earned from these certificates will help you to further decrease your overall investment for solar hot water or air source heat pump installation. Learn more about AECs by visiting the Mass DOER website. If you're installing solar air source heat pumps, you may be elgible for a 0% interest HEAT Loan from Mass Save to finance the projects. 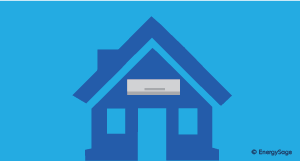 You can finance up to $25,000 of home energy efficiency upgrades. Find out more about the HEAT Loan here. Massachusetts has a host of incentives and rebates available to help decrease your investment for air source heat pumps. Learn more about rebates available from Mass Save, or apply for the rebates here. Should I go with a ducted, or ductless system? Do you live in a multifamily building? Many Cantabrigians live in shared buildings. If you live in a multifamily air source, heat pumps are a good solution to heat and cool your home. That being said, there are extra considerations to take when installing this technology on a shared property. 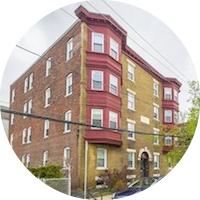 Our no-cost Retrofit Advisor can help your apartment or condo building learn more about suitable clean heating and cooling options and help you find ways to finance your project. or call 617-349-6464 to get started. Air source heat pumps will operate under a wide range of temperatures, but the colder it is outside, the less efficient the heat pump will be. Fortunately, there are cold-climate air source heat pumps specially designed to operate efficiently at lower temperatures (even below 0 degress farenheit!) This newer technology is often installed in places with harsh winters, such as New England or the Midwest. In Cambridge, it's a good idea to install cold-climate air source heat pumps so you can continue using them on particularly cold days. For most homes, it will also be a good idea to have a backup source of heat. Many homeowners choose to keep their existing furnace or boiler for this purpose. 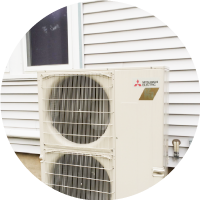 John G. just installed a ducted air source heat pump system to heat and cool his home in Massachusetts. After taking advantage of alternative energy credits (AECs) and $550 in rebates, he's saving roughly $1,200 a year in energy costs. John's system is also paired with a rooftop solar panel system, powering the heat pumps with clean, renewable energy. His advice to people considering this technology? "Look into it!" 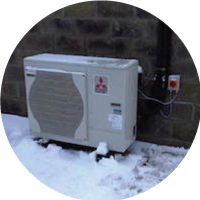 Read more about John's air source heat pumps. Seth F. installed mini-splits for his mutli-family home in Massachusetts. He took advantage of the zero-interest HEAT loan and saves roughly $1,000 a year. His mini-splits are also paired with solar PV system and insulation from MassSave. Seth's system covers 100 percent of his heating and cooling needs: "Don't be afraid of relying on heat pumps as your sole heating system--cold climate heat pumps have plenty of power as long as your home is insulated properly." 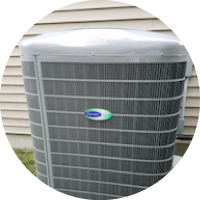 Learn more about Seth's air source heat pump installation. 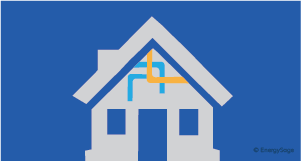 Want to learn more about air source heat pumps?